Located on the delta of Parana river, in Entre Rios province, you will have the chance of searching for freshwater Dorados sailing through thousands of streams, trying to catch this combative fish. This traditional duck hunting lodge, is opening its doors today to recieve enthusiastic fishermen who want to try the incredible experience of Dorado fishing. Located on the delta of Parana river, in Entre Rios province, you will have the chance of searching for freshwater Dorados sailing through thousands of streams, trying to catch this combative fish. 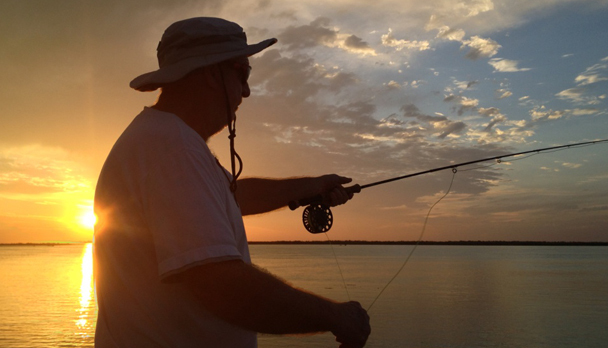 Fly fishing is the most popular type of fishing, but spin fishing and live bait are allowed too. 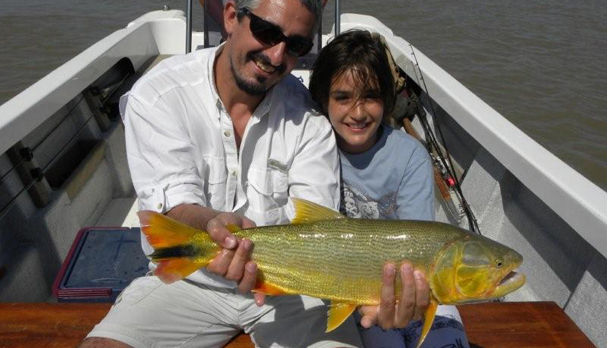 The Dorado (Salminus Maxillosus) or "the Tiger of the Paraná" is a very aggressive fish in sport fishing. Although the dorado may reach 30 pounds, the average size in this area has held between 4 and 12 pounds, but there are also larger ones. The freshwater Dorado is considered to be the single most challenging native freshwater game fish of South America. It is a radiant, golden-hued, salmon-like fish with an extremely powerful jaw and razor-sharp teeth. Unlike the salmon, however, the Dorado does not succumb after spawning and never swims to the ocean. The Dorado is an exceptionally strong swimmer. The world record is 70 pounds. 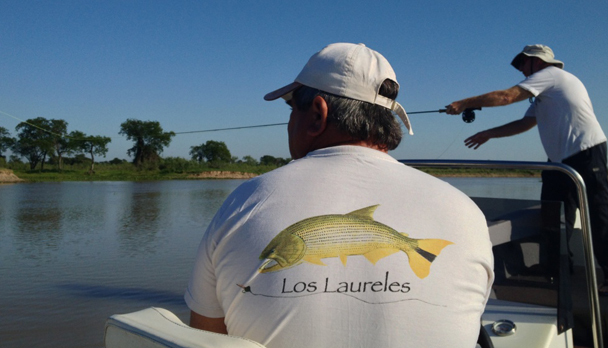 In Los Laureles Lodge fishing starts early in the morning. Breakfast is served at 7.00 consisting of coffee, toasts, jams, bacon and eggs, etc. Fishing goes on until 12.00, when you go back to the ranch to have lunch: a starter, a main course and dessert, served with wine, beer, fizzy drinks or mineral water. Then, you can rest or even take a nap up to 4 o'clock when you go back to the river to keep on fishing until 8.00 in the evening. Before dinner you may try a wide variety of cheese, ham, olives and drinks; dinner consists of three courses (starter, a main course and dessert). There are fully equipped boats for fly-fishing and experienced guides who know every corner of the river to fulfil the expectations of the anglers. The resort is located on the banks of the Parana river, close to Cerrit town. Los Laureles lodge has all the necessary services to accommodate 12 fishermen. Six double rooms, all en-suite with private bath with AC and jacuzzi, a big dining room with an adjoining grill, a sitting room, a rest room, another rest room with satellite TV and music and a swimming pool. Light shirt and trousers for tropical weather (Exoficcio, Patagonia, Columbia, etc. ), hat or cap, neoprene wading boots or a good pair of sandals, a light water-proof jacket, a polar sweatshirt or warm jacket (the temperature decreases at night) polarized sunglasses, sunblock SPF 40 or higher, Insect repellent. Rods: Two, if possible. 9ft, 5 and 7weight. 3-or 4- piece, if possible. Lines: WF floating line and a sinking tip line. Leaders: for 5- to 7-foot floating lines with strong butts to turn big flies, 16-pound test tippets with 20 cm of 20-pound test steel wire. Fies: Sizes 2/0 and 3/0, Deceiver patterns.Colors: black, black and red or black and yellow, chartreuse, white and yellow and white and olive have proved good options. Accesories: tweezers, hook sharpener, nippers, boga grip, etc. Rates include: Transfer Santa Fe airport/Lodge/Santa Fe airport, 4-night accommodation with all meals and beverages, open bar 24hs, 3 and 1/2 fishing days with guide and boat. Fishing licence. Rates do not include: Airfare Buenos Aires/Santa Fe/Buenos Aires, personal health insurance, fishing equipment and flies, staff and guide gratuities. Notes: The package offer the possibility to hunt for doves with no extra cost except gun rental, hunting licence and shells. 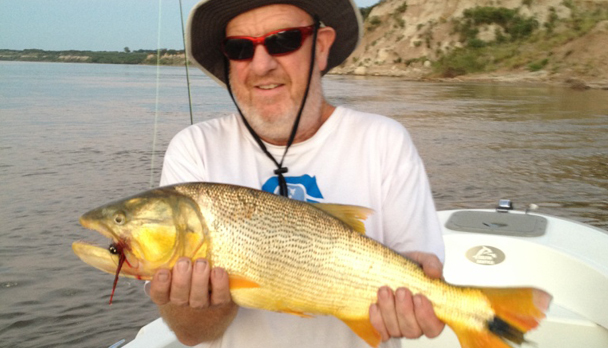 Very good golden dorado fishing in the Parana river and some streams. We had a great time at Los Laureles our only complaint- too much food!! they spoilt us :) we are not used to eating so much. Aside from that they were lovely great hospitality and the fishing was excellent. I went out with Blue one afternoon and he caught a few. I think he said he caught 25 all together and the biggest he caught within an hour of us arriving! Thank you for all your help with that part of our holiday we really enjoyed the rest and relaxation.